Tessa Farmer’s work involves highly detailed mise-en-scenes of plant roots, bones, insects and animals engaged in ferocious battle. Her creations are located in a space between preservation and perversion: the reality of the taxidermist pitched against an alternative world of fantasy, in which bloodthirsty fairies launch invasions and declare their supremacy over a host of worthy opponents. Farmer’s fairies are rooted in Gothic and Renaissance folklores that recognise a darker sense of purpose – harbingers of destruction rather than Disney-topped confections. In June 2007, Farmer began a residency with the Natural History Museum. Working with experts from a variety of specialisations within the Department of Entomology, she entered into discussions with Gavin Broad, Stuart Hine, Jan Beccaloni, David Goodger, Andy Polaszek and Sharon Shute. 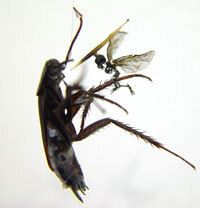 She has devoted much of her research to the parasitic wasp, which habitually invades and devours other creatures in order to survive and prosper. Work produced in response to new information and ideas gathered and exchanged will be shown in the Museum Central Hall in Bay Eight. Farmer has produced a sculptural installation for the vitrine, in which her minute fairies stage a gruesome sortie, reminiscent of the parasitic wasp, on a fox in a bid to use its body as a host for future generations. Drawings produced during the residency echo Farmer’s experiences in the lab: developed with the aid of a microscope, there is a sense of ‘legitimacy’ to many of these fraudulent, deviant drawings that suggest the hand of the scientific illustrator. A stop-motion animation, developed as a collaboration with Sean Daniels, reveals a ‘behind the scenes’ version of events within the Museum’s storage areas. Away from the public eye, out of the view of the scientists, a new landscape has emerged: littered with bones and insects, a single fairy lures a long horned beetle out from a 'cave' and a gathering horde of fairies overcome their prey. The residency and exhibition are documented in a catalogue, featuring commissioned texts from Bergit Arends, Jane Neal, Gavin Broad and Stuart Hine. A discussion between entomologist Gavin Broad and Tessa Farmer will take place during the exhibition period. Tessa Farmer received an MA from the Ruskin School of Drawing and Fine Art, University of Oxford. She was selected for New Contemporaries in 2004, and has shown at firstsite, Colchester, Northern Gallery for Contemporary Art, Sunderland and in Parabola’s Repatriating the Ark at the Museum of Garden History. Her work will be shown at the new Saatchi Gallery in 2008 and the Museum of Old and New Art, Tasmania in 2009. Little Savages is curated by Danielle Arnaud, Parabola. The residency would not have been possible without the support of Bergit Arends, Curator of Contemporary Arts and Mandy Holloway, Zoology Enquiries and Public Access Co-ordinator at the Natural History Museum, London. The residency is funded by The National Lottery through Arts Council England, David Roberts and the Natural History Museum.